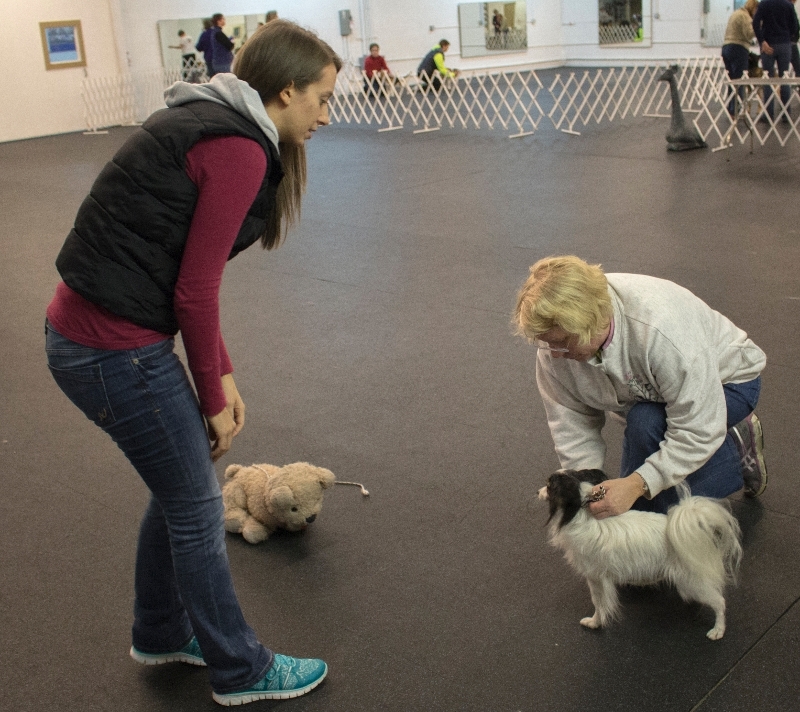 At the Family Dog Training Center in Kent, instructor Jennifer Mogren assists Ann Eggers, of Kent, and her Papillon with the stand exercise. Admit it, some of the dogs in your life have learned at different rates. Some catch on quickly in puppy kindergarten and basic obedience. Others, well, not so fast. Guess what? Two-legged students are the same. Take it from Jennifer Mogren, a first-year Auburn Riverside High School language-arts teacher, and Mary Berry, a longtime Issaquah School District elementary-school librarian, both of whom have instructed at Family Dog Training Center in Kent for varying lengths of time. For both, many of the skills they cultivated in dog training overlapped into the class rooms to different and varying degrees. Mogren talks Shonnie Layland, of Auburn, through a technique to help her Leonberger puppy, Kiss, hold the sit/stay position. Mogren, 27, began an apprenticeship program at Family Dog Training Center in January 2014 and began teaching there in July 2014. At that point, she was six months into a two-year Master of Arts in Teaching program at Seattle Pacific University. It is incumbent on her, Mogren emphasizes, to offer instruction in a variety of ways so that all learners can understand the concept. Teaching at Family Dog, she has learned patience and compassion, noting every student walks through the door with emotional baggage. “It’s hard to train your dog when you had a bad day at work. It’s hard for high schoolers to focus on learning when they are struggling at home.” Both of these teaching venues have taught Mogren the importance as an instructor to listen to the students and provide them with a positive, safe learning environment. “I can’t control what goes on outside the classroom but I can give my full, positive support to them within it. I have learned to become a better judge of when students need a reality check and when they need the truth spoken with a little more kindness,” she adds. 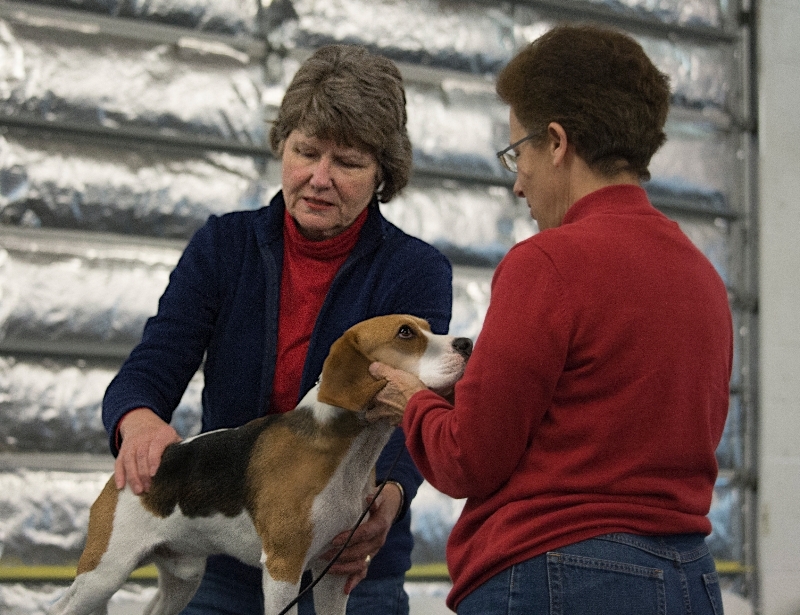 Mary Berry assists Sue Critchlow, of Bellevue, with the judge’s exam of her Beagle puppy during a breed ring handling class. Instructing dog obedience for a full year before she began teaching high school, instilled confidence and growth in her ability as an instructor, Mogren says. Mogren admires Lang’s teaching style and notes that she has learned from her the importance of teaching the same skill or concept in multiple ways in order that it makes sense to a variety of learning styles. 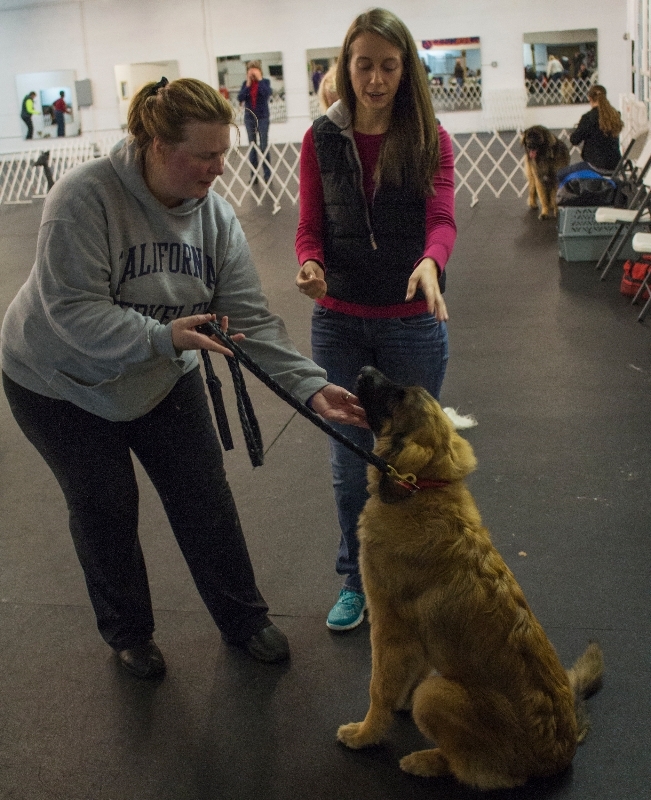 Tiffanie Coe, of Black Diamond, and her Leonberger receive pointers from Berry as they polish their judge’s exam. While the teaching skills from Family Dog to Auburn Riverside High School translate in broad terms it is not a case of one size fits all, since there is a student age differential. “Teaching high schoolers is more like a beginning or advanced home-obedience class where you are starting to have the students take more responsibility for their action and you can begin teaching higher level, more fun exercises,” she says. 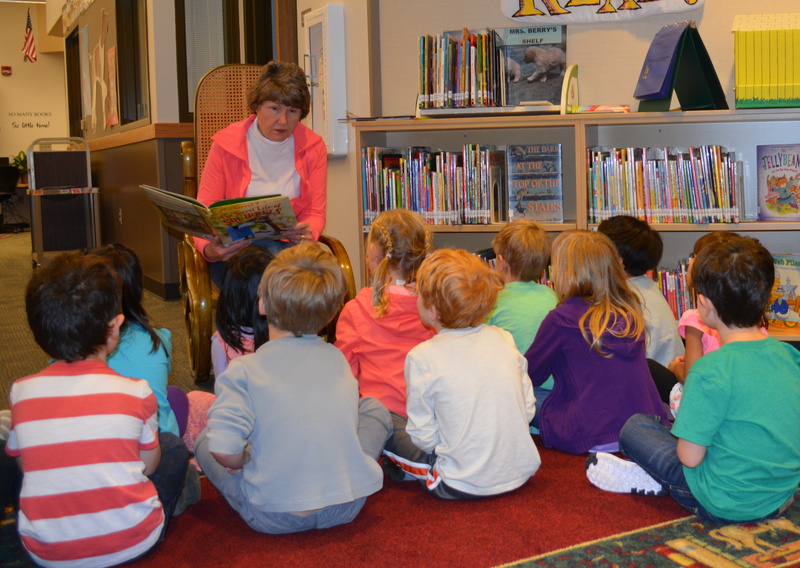 Berry, conversely, is a longtime educator, serving as a full-time librarian for 23 years in the Issaquah School District, teaching love of reading and literature, library-use and research skills to kindergarten through fifth-grade students. 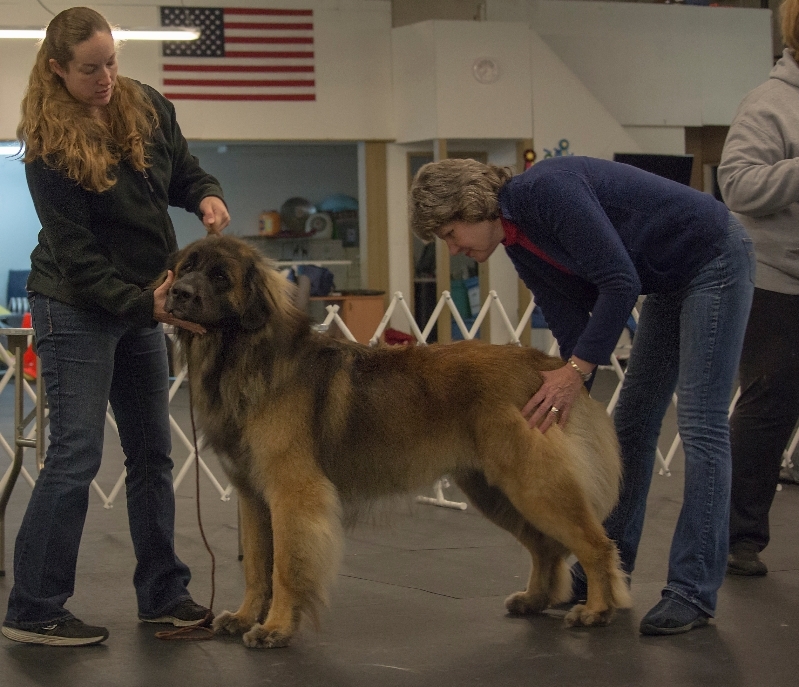 She began training with Lang in 1985 with a Belgian Tervuren, her first conformation and obedience dog and has taught classes intermittently since then. 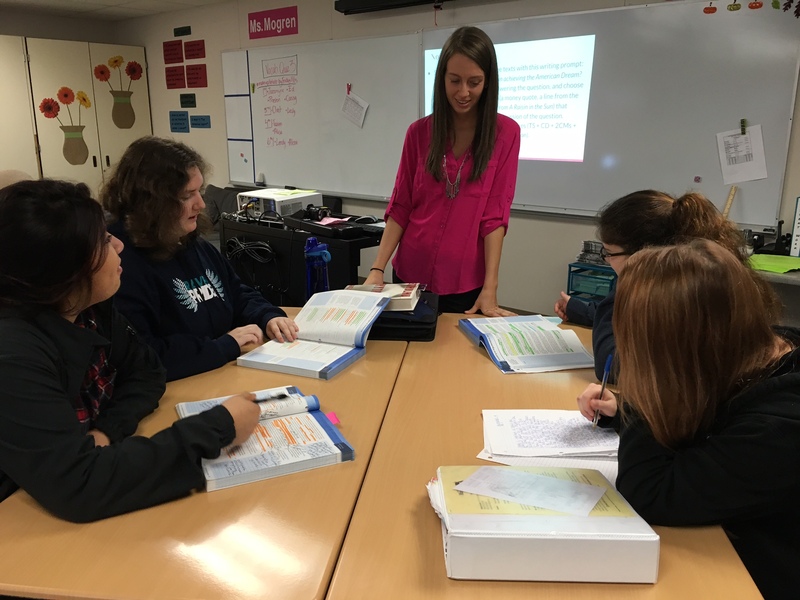 After giving the whole class instruction at Auburn Riverside High School, Mogren checks in with groups of students during their work time. This allows her to ensure that students are on task, understand the material and provide additional individual instruction as needed. Kindergartners at Challenger Elementary School in Issaquah share their reaction to a story shared by Berry. A classroom teacher must be aware of these types of behavior nuances in whatever the audience is. Some students, whether child or adult, can be pushed into performing better with praise or feedback, others need time to have to work it out on their own, she emphasizes.